Fighters The actor teamed up with Kavanagh to beef up his skills. Game of Thrones and MMA have become interlinked in recent months as it was revealed that the Mountain had trained with UFC Featherweight Champion Conor McGregor’s coach, John Kavanagh. And now another star has decided to follow suit and become the latest actor from the HBO series to train with John Kavanagh at the world famous SBG gym. 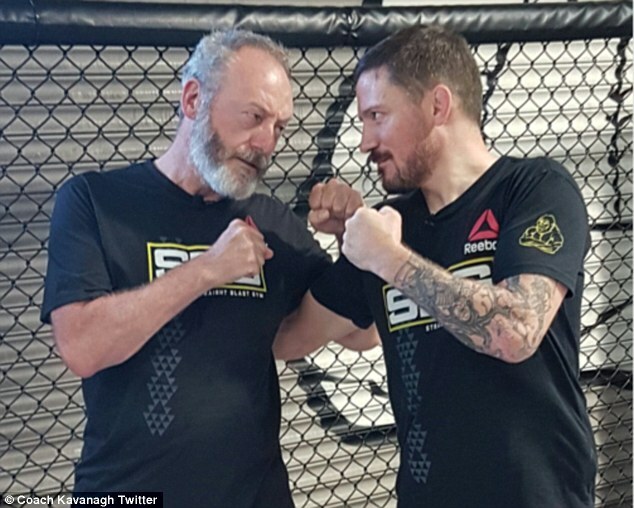 Liam Cunningham, who plays Ser Davos Seaworth in the hit series, stepped into the octagon over the weekend to brush up on his fighting skills and what better way to do it then team up with fellow Irish man Kavanagh. Kavanagh has been one of the driving forces behind the rise of his fighter Conor McGregor in recent years, building a gym in Ireland from nothing into a worldwide recognised brand. McGregor himself has been in training for his bout with Nate Diaz in Las Vegas at UFC 202.